What Do Mormons Believe? » Does God still speak to us today? While preparing for a class, I came across this talk given by Hugh B. Brown, a member of the First Presidency of our church, who passed away some years ago. It details a conversation that he had with a member of the British House of Commons and a former justice of the supreme court of Britain regarding our belief in the reality of modern-day prophets. I will never understand why people reject the doctrine of God still being able to call prophets. He has always done so and will continue to do so. I firmly declare that Joseph Smith was a prophet of God and that there is a prophet today who speaks for God. Prophets are essential to us knowing who God and Jesus Christ are—their characters and their teachings that will bring salvation. You too can know of this truth if you will sincerely ask God in prayer with faith to act. When I went to his office, he said he had been intrigued by some things I had told about my church. He asked me if I would prepare a brief on Mormonism and discuss it with him as I would discuss a legal problem. He said, “You have told me that you believe that Joseph Smith was a prophet and that you believe that God the Father and Jesus of Nazareth appeared to him in vision. I suggested that, as I had been working on such a brief for more than 50 years, we proceed at once to have an examination for discovery, which is briefly a meeting of the opposing sides in a lawsuit where the plaintiff and defendant, with their attorneys, meet to examine each other’s claims and see whether they can find some area of agreement and thus save the time of the court later on. Did God speak to people between 100 and 1820? Of course! Real revelatory communication came to faithful people all over the world, and it still does! The difference is that these words were limited in scope to the person receiving them. Between (around) AD 100 and 1820 there was no authorized prophet to dispense God’s message to the whole world. Err, at least the Old World. We read in the Book of Mormon about prophets in the New World who survived at least until about AD 420. 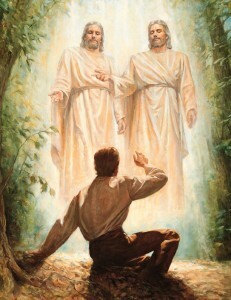 Heavenly Father also restored to Joseph Smith the power to give the gift of the Holy Ghost by the laying on of hands, which allows baptized disciples constant access to more and deeper revelation than was available before. Thanks for your question, Mike! Superb. I love that story.